Place the cream in a small, heavy saucepan and heat it over medium heat until it is hot and begins to bubble around the edge. Place the chocolate in a metal bowl and pour the hot cream over it. Let the cream stand for 2 to 3 minutes while the chocolate melts. Slowly stir the chocolate mixture. Be careful not to stir too vigorously, or you will add too much air to the ganache. Keep stirring until all the chocolate is melted and completely blended with the cream. Scrape the mixture into a bowl, cover it with plastic wrap, and let it sit at room temperature for at least 4 hours. The mixture will firm as it cools. 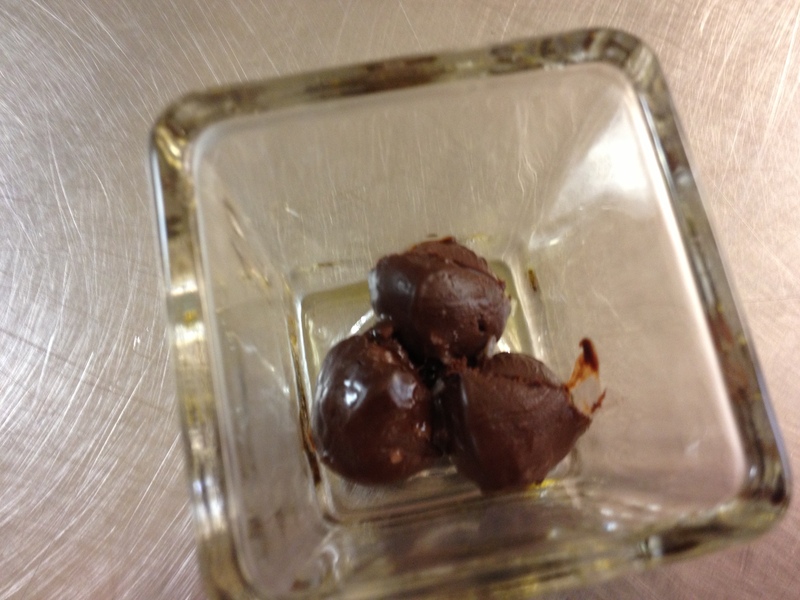 To serve, using a melon baller, scoop balls of the mousse into small serving containers. (Mary Ann used votive candle holders which were perfect!) Lightly drizzle olive oil around mousse and sprinkle salt on top. If desired, place a very thin bread stick into the mousse, adding another dimension. Special thanks to Mary Ann Anschutz for discovering and developing this recipe! Posted in Cookies and Treats and tagged no-cooking mousse. Bookmark the permalink.